Hands up if you wanted to be a superhero when you were a kid. Who ran around the garden with a blanket knotted round their shoulders, pretending to fly, and trying to make their sister be your sidekick? Some of us never grow out of our superhero daydreams. I am one of them. Luckily for me, I discovered cosplay. Cosplay is wearing costumes to represent a character, usually drawn from comics, television, movies or games. It’s much more than just wearing your pants over your tights (ok, sometimes it is just that…), I promise. But wait, I hear you cry, aren’t all the big events for cosplayers in America? Actually, no. We have a very healthy cosplay and convention scene not only in the UK, but right here in Birmingham. MCM Birmingham is the largest event on the Birmingham cosplay calendar. Run by MCM Expo Group, the Birmingham leg of their national events is held twice a year at the NEC. Alongside hundreds of dealers, a comic village, and an e-sports zone, cosplayers can take part in the Masquerade competition on the MCM Main Stage. Visitors can also listen to talks from and arrange signings with stars including Red Dwarf’s Robert Llewellyn, Assassin’s Creed Syndicate’s Paul Amos and the Bionic Woman herself, Lindsay Wagner. Fun fact: MCM Birmingham is one of the conventions featured in documentary Tom Felton Meets the Superfans. Tom spent the day roaming the NEC cunningly disguised as the Joker. Everybody spent a lot of time staring very hard at every Joker they passed. A must for any anime enthusiast, Kitacon Karnival brings a cosier convention to the Hilton Metropole Hotel, with just 1000 tickets up for grabs. With a cosplay masquerade, a talent show and craft building sessions, Kitacon is certainly a unique event. As with all conventions, there will also be plenty to tempt you from a host of stalls too. Fun fact: Every year, Kitacon has a theme. Last year’s Back to the Kitacon was their most successful event yet. This year, they’re bringing the big top to Birmingham for Kitacon Karnival, and are hoping to turn out something even better. Birmingham Comics Festival, held at Edgbaston Cricket Ground, was a new event last year. Returning for a second year, this time around they’re going even bigger. With a focus on comic book creators rather than the stars of the big screen, this convention is perfect for discovering talent. This year, you can climb aboard The Tumbler from the Batman movies, witness amazing body painting and meet creators from The Beano, 2000AD, Marvel and more. Fun fact: Last year’s convention was the top pick for a lot of cosplayers last year. This year has the most cosplay guests I think I’ve ever seen at a convention. Cosplay guests include the Marshall Family (amazing Warhammer costumes), The Super Heroes (who I hear are bringing a working Mjolnir with them) and uh…me and my crew of X-Men. Returning to The Studio on Cannon Street, this isn’t strictly a cosplay event, but cosplayers are always welcome. More an event for the collector than a family day out, ICE showcases comics from the biggest new superhero releases to the coolest small press books. There’s a full programme of signings, talks and events to keep you busy all day. This year’s guests include Superman artist Marco Santucci, Daredevils’ TV writing team and acclaimed writer Peter Milligan. Fun fact: This year’s extra events around the main expo are being hosted by podcast superstars Geek Syndicate. Geek Syndicate founders Barry Nugent and David Montieth are experts on all things comics, games, tech and of course, whiskey. Alongside the larger scale events, there are also plenty of smaller happenings to keep you in your cape. 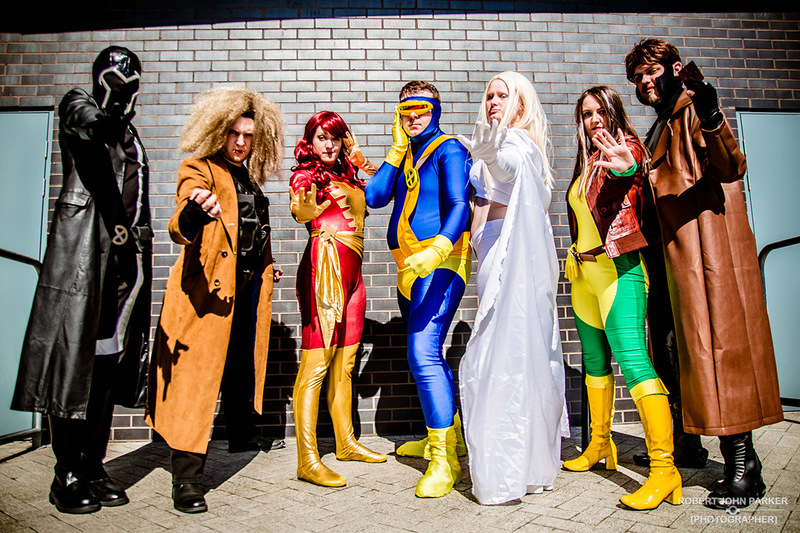 With regular meet-ups held by Animeleague, events at Nostalgia and Comics for Free Comic Book Day, and a host of smaller conventions around the West Midlands, Birmingham is a real haven for cosplayers, be they, beginner or enthusiast.